Apple has been trying to get its $1 billion data center in County Galway, Ireland built for well over two years now, and last week the company finally won approval for construction by the Irish High Court. While it was expected that Apple would now move forward and begin planning for construction, two local residents have brought up a new legal challenge for the company. 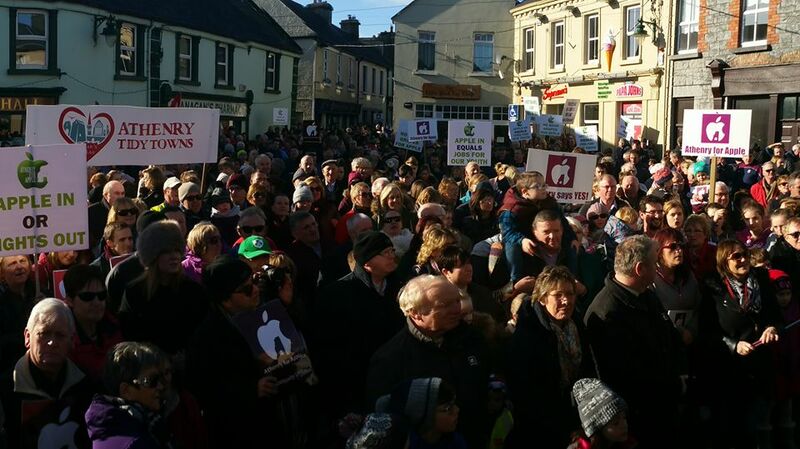 As reported by The Galway Advertiser (via Business Insider), two Athenry residents have requested a certificate to appeal the court ruling made last week that granted Apple permission for the project. The case is said to be due back to the court on Wednesday, October 25. Previously, the same individuals challenged Apple's data center by citing multiple environmental concerns, but their challenge was rejected. Environmental protection issues have been the source of the objector's arguments for the last few years, originally arguing that Apple's data center could have negative effects on local animal populations, and could lead to potential flooding concerns on a neighboring golf course. Then, the data center's proximity to a local nuclear power plant was used to bring up new objections to the site's construction, despite the plant having been shut down for years. Many locals still support Apple's data center in the area, with the leader of the Apple for Athenry Facebook group telling Business Insider that "the collective hearts of Athenry sank" when the new legal challenge was brought up this week. Apple originally wanted the data center to be up and running by early 2017, but these repeated setbacks have greatly elongated the company's timeline for the site. Once it is functional, the Derrydonnell Forest data center will see ongoing construction over 10-15 years, supporting services like the App Store, Apple Music, Apple Pay and iCloud. Update 11/1: Ireland’s High Court has rejected the residents' appeal against Apple’s data center, "clearing the way for the project to proceed" (via Reuters). I don’t get why Apple doesn’t just say ‘**** it’ at this point and move elsewhere. Move it to the UK or somewhere nearby on continental Europe like France or Spain. If you've invested a lot of money into choosing a site and there are commercial and other reasons for choosing a particular site, then you wouldn't give up. Clearly that site has a number of advantages to Apple and it definitely won't be outside of Ireland because of the massive tax benefits in the country. There's also huge advantages offered by Ireland's climate. Cooling prices in Spain (and in parts of France) are going to be astronomical. The UK is not really a safe pair of hands now in terms of data import/export. Who knows what the regulatory environment's going to be like in a couple of years? Who knows if data export to the UK will even be possible from the EU, etc. Ireland's also extremely well connected to the USA, the UK and mainland Europe (bypassing the UK through IFC-1). Just follow the money. Apple may be wanting the Data Center there also to justify keeping their $215 billion in profits there and paying approx <1.5% in taxes. Right now Apple has money there and no businesses there and stashing billions in cash virtually paying no taxes. Only $16.6 billion is held in the USA by the way. How much do you as a citizen pay in taxes? Horrible how the world has favoured the ultra rich. Your post is totally inaccurate. Apple has huge business in Ireland. They employ thousands and thousands of people here and their entire European operation is based in Cork, where they employ 5,500 people. They also paid far more than 1.5% in Irish tax when you exclude non-resident companies. Why would Apple keep money in a country that is not friendly to enterprise, like the US? Apple owes nothing to the US. Just follow the money. Apple may be wanting the Data Center there also to justify keeping their $215 billion in profits there and paying approx <1.5% which is virtually paying no taxes. Only $16.6 billion is held in the USA by the way. How much do you as a citizen pay in taxes? Horrible how the world has favoured the ultra rich. The simple fact of the matter is only a handful of residents want the project stopped and they know the only way it can happen is if they delay Apple in the courts long enough that Apple will eventually get fed up and leave, building the data centre somewhere else. A local nuclear power plant? Ireland has no nuclear power plants! They're referring to one in the UK! BINGO. Power and cooling are some of the largest ongoing expenses for data centers. If you can cool with ambient air, or at least not have to chill the data center very much below ambient, you're going to save a fortune. Fair enough, let a Chinese company build one instead. They will clearly be the greener choice. If you've invested a lot of money into choosing a site and there are commercial, legal and other factors for choosing a particular site, then you wouldn't give up. Clearly that site has a number of advantages to Apple and it definitely won't be outside of Ireland because of the massive tax benefits in the country. No doubt Apple will get their way eventually, just like most corporations do with big bucks to spend. If cooling was an issue then there are many countries with colder climates (not too cold though) that Apple could chose rather than Ireland. I therefore do not think cooling played a part in Apple's thought process. There are; however, have they the developed power grid and internet connection that Ireland has? Power and cooling would certainly explain why a data center would not be moved either to Spain or the south of France, for example, where summertime temperatures reach as high as 45C. Personally i think it has something to do with the long term case brought by the EU against Apple and Ireland that was recently ruled open. Allowing Apple 0.0005% tax does equate to state aid which is against EU law. I have yet to see a shred of substantiation for this 0.0005% figure.